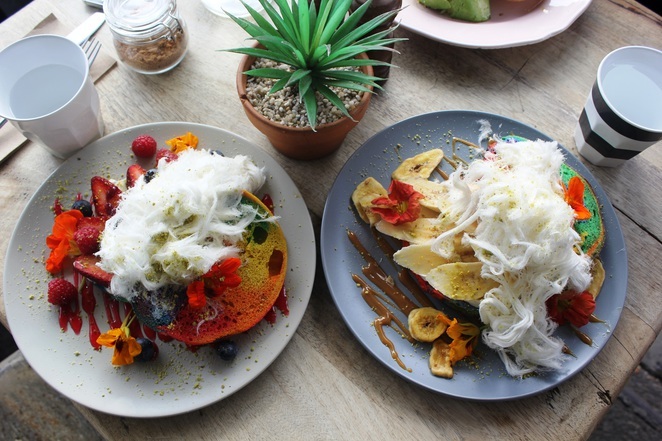 Here is a cafe that doesn't stop re-inventing its menu. 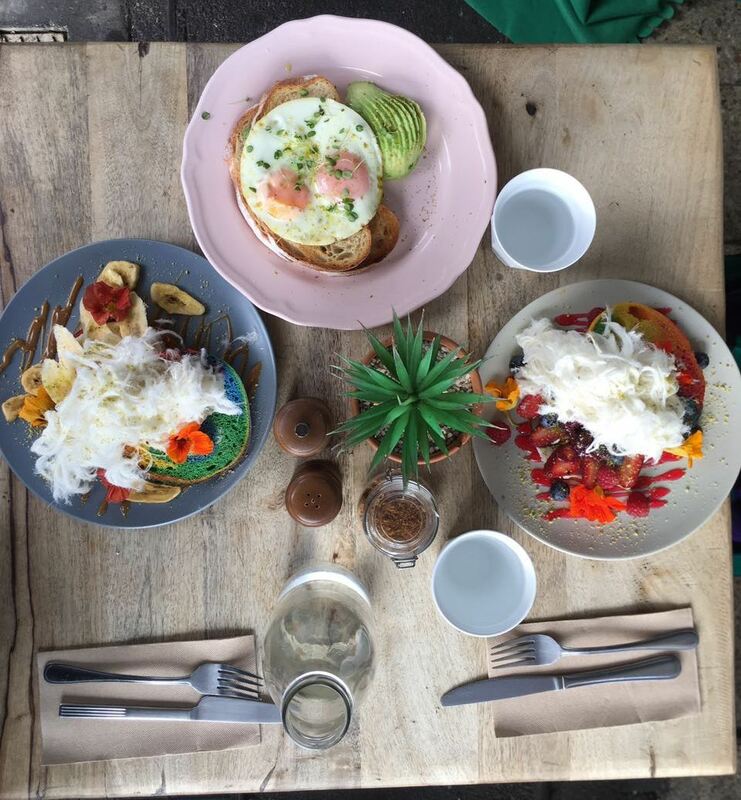 Initially, it was the coffee, the cronuts, then the pea-smash on sourdough with fresh burrata cheese, their outstanding brunch menu and now The Tiny Giant cafe in Petersham introduces Rainbow bagels and the much-awaited coffee in a cone #awesomefood. Give people good food and consistent service and it will draw them back time and again, it's that simple. The Rainbow Bagels were on the special's board and it was definitely a contender for breakfast ideas. There are 2 bagels in the menu, both equally exciting. If bagels, cream cheese and fresh fruits are your thing - look no further. Once you see the pictures my bet is that at this stage, you'll be drooling. 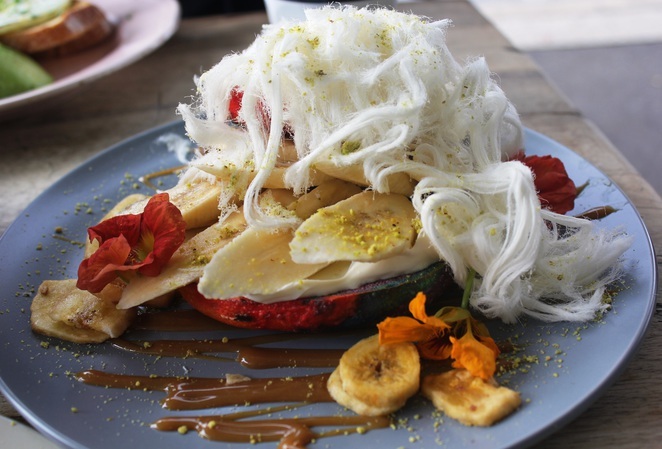 Over the Rainbow Banana Bagel, is served with fresh banana, dehydrated banana, mascarpone cream cheese, salted caramel, caramel Tim Tam crumb, vanilla Persian pashmak (fairy floss) and shredded coconut. The characteristic hard and chewy bagel exterior and delicious cream cheese coupled with the freshness of the banana and the salted caramel made a great combination. The dehydrated banana pieces added a lovely crunch to the dish. 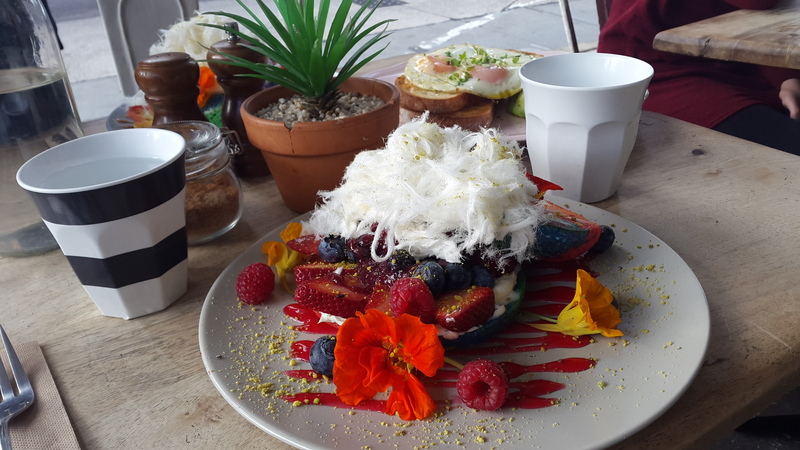 Over The Rainbow Berry Bagel, served with mixed fresh berries, mascarpone cream cheese, pistachio crumb, berry coulis and vanilla Persian pashmak. As pretty as this one looks, it is filled with the goodness of the berries. Served with a generous handful of fresh berries this bagel was my favourite of the two. Foodie recommendation: Make it a bagel and coffee special because the coffee in a cone has arrived in Sydney. There is a pot of gold over the rainbow and this time I found it. 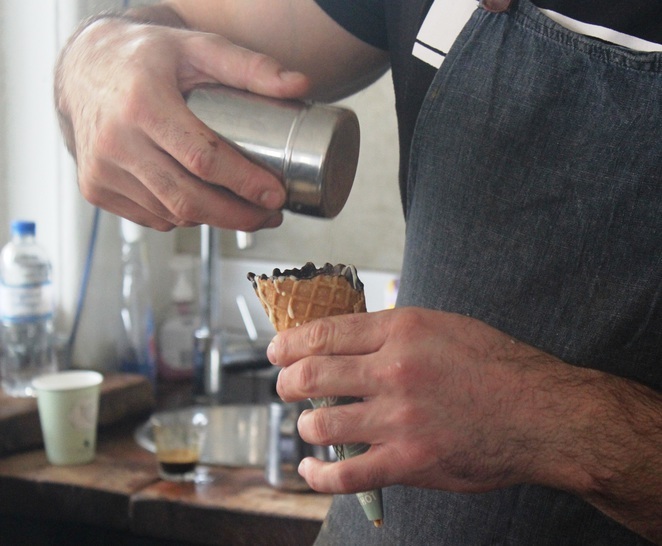 The coffee in a cone is nothing short of liquid gold. 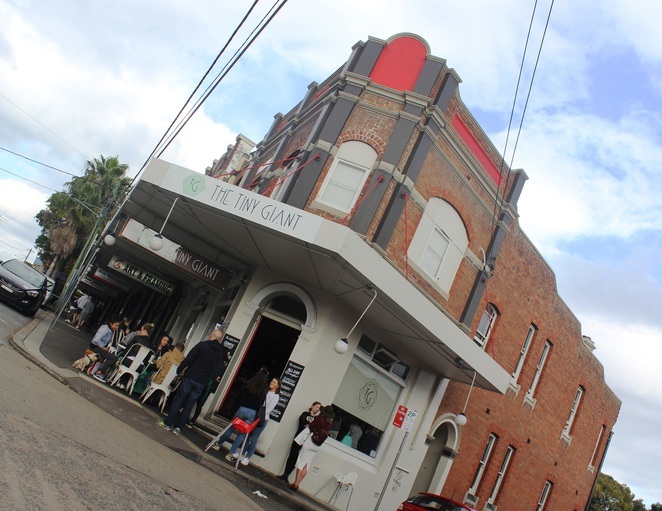 The Tiny Giant is known to make its food look over the moon and delectable, however, this time the coffee absolutely steals the show. Priced at $6.90, the coffee in a cone is something special. Introduced in South Africa originally, this soon became an Instagram sensation coffee. 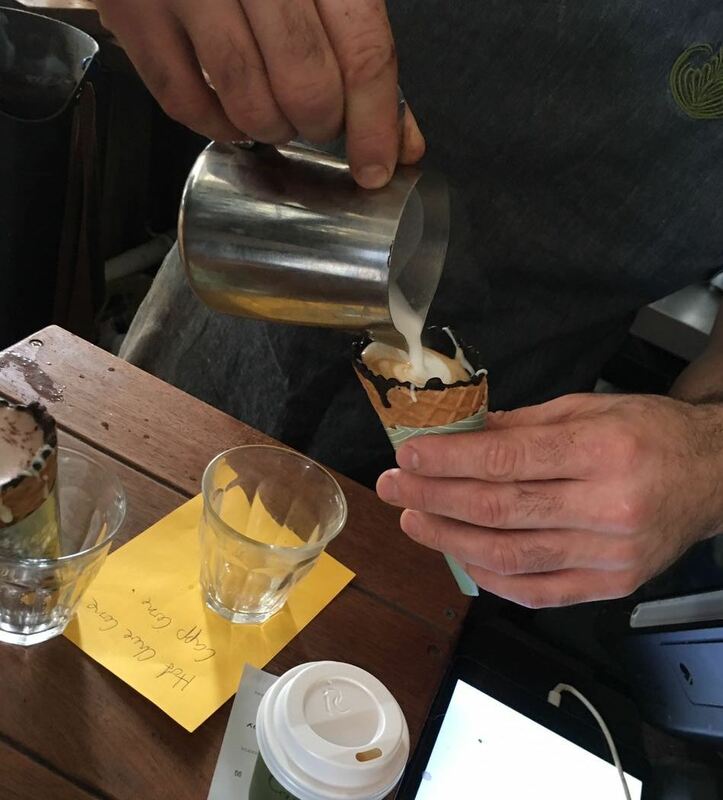 Coffee in a cone has now arrived in Sydney and is served at the Tiny Giant. 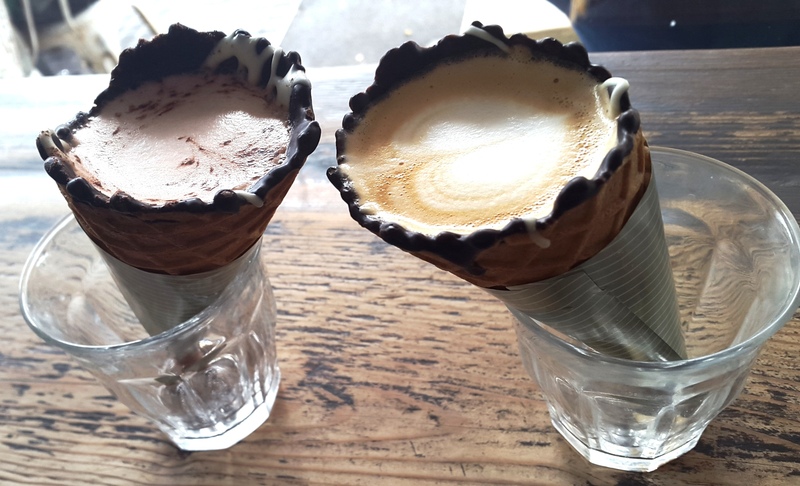 Served in a cone layered with thick chocolate, this dessert coffee hybrid combo stays hot for up to 10 minutes as you drink your coffee. 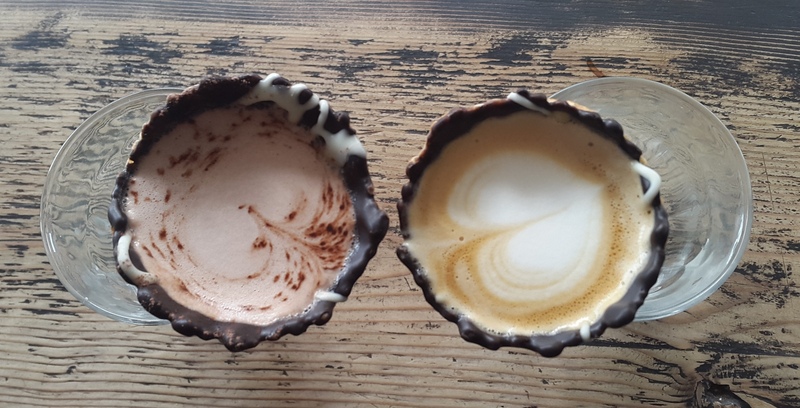 Almost any coffee can be served in this. The deliciousness of the chocolate cone melts slowly, adding to the taste of the coffee. What it makes is a very satisfying end to any meal. Your Sydney food list and top eats is not complete without a visit to The Tiny Giant at Petersham and they make their stunningly colourful entry into Sydney's must-have bagels and coffee in a cone. Those bagels have a fairy look to them. Would love to try them out. Wow, looks great! Glad the rainbow bagel trend has finally made an appearance in Sydney.